Our next major photopost will be for Laetare Sunday, the second Sunday of the liturgical year when rose-colored vestments may be used. Please send your photos (whether of the Ordinary or Extraordinary Form, Ordinariate Rite etc.) to photopost@newliturgicalmovement.org for inclusion. Photos of Vespers and other parts of the Office are always welcome, as well as liturgies of the recent feasts of St Joseph and the Annunciation; for our Byzantine friends, we will be glad to include photos of the Veneration of the Cross on the Third Sunday of Great Lent. Please be sure to include the name and location of the church, and always feel free to add any other information you think important. Evangelize through beauty! 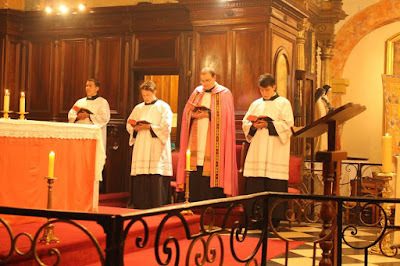 From our second Laetare photopost last year, Vespers at the church of St Trophime in Bourme-les-Mimosas, France, celebrated by our friends of the Fraternity of St Joseph the Guardian. From the first post, the Sunday of the Veneration of the Cross at St Peter Eastern Catholic Church in Ukiah, California.